Often called the “Muslim archipelago,” Southeast Asia is home to more than 240 million Muslims -- about 42 percent of Southeast Asians, and about 25 percent of the world’s 1.6 billion Muslims. 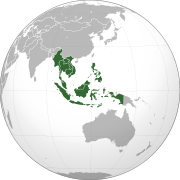 Most Southeast Asian Muslims are Sunni, and follow the Shafii school of Muslim jurisprudence. Islam is the official religion of Malaysia and Brunei, and an officially recognized religion of Indonesia, Thailand, and the Philippines. Historically, it is not clear exactly how and when Islam came to Southeast Asia, but there is little doubt it was spread for the most part by merchants in the 12th century. By the time the Portuguese arrived in the early 16th century, Islam had a firm footing. This continued in the 17th century, when Arab traders and scholars/holy men from Hadramawt settling in the area introduced Sufism, a form of Islamic mysticism. Over the decades, many Southeast Asian Muslims began translating Islamic religious texts in Arabic into the regional languages. As a result, two types of Islam emerged, local and orthodox, and both types continue to co-exist today. In addition, there are two other influences from the Middle East: puritanical Wahhabism from Saudi Arabia, an 18th-century reformist/revivalist movement; and the Islamic modernism and revival, which are late 19th and early 20th century responses to Western colonial influence and to the political decline of Muslim powers. cartoMisson [cartographer]. (2015). 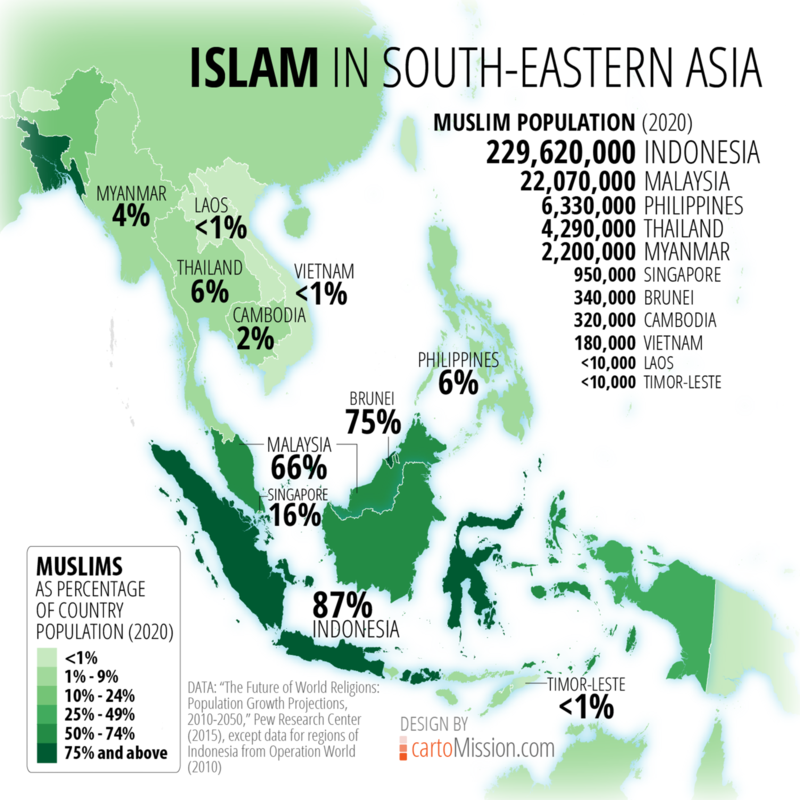 Islam in South-Eastern Asia [map]. Scale not given. Retrieved from https://cartomission.com/2015/08/28/islam-in-south-eastern-asia/. De Graaf, H. J. (2002). Indonesia and Malaya: The Great Muslim Empires [map]. 1: 16,100,000. In Hugh Kennedy (ed. ), An Historical Atlas of Islam. (2nd, revised ed.) Leiden: Brill, 2002 (p. 66). De Graaf, H. J. (2002). Indonesia and Malaya: The Coming of Islam and the First Muslim Empires [map]. 16,100,000. In Hugh Kennedy (ed. ), An Historical Atlas of Islam. (2nd, revised ed.) Leiden: Brill, 2002 (p. 65). The History of Chinese Muslims’ Migration into Malaysia / by Ma Hailong [School of Ethnology and Anthropology, Qinghai Nationalities University, Dirasat 27 Dhul Hijjah, 1438 - September 2017 King Faisal Center for Research and Islamic Studies] The purpose of this paper is to examine the history of the Chinese Muslims who moved to Malaysia and explain the different factors that have influenced this migration at different historical stages. I separate this history mainly into two parts, namely, before the twentieth century and from the twentieth century onward. Before the twentieth century, the majority of Chinese Muslims who streamed into Malaysia were Chinese immigrants who became Chinese Muslims by converting to Islam. From the twentieth century onward, however, the majority of Chinese Muslims who came to Malaysia were Muslim Hui from China, who believed in Islam and spoke Chinese, and who constituted an ethno-religious minority group.